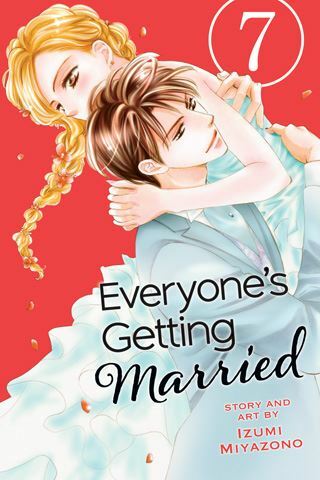 VIZ Media Announces Arrival of "Everyone's Getting Married"
In her mid-20s, Asuka Takanashi is a successful career woman with an old-fashioned dream. She wants to get married and become a housewife. She thinks that she is getting close to that dream, but her boyfriend of five years abruptly breaks up with her to pursue his own career goals. Asuka next meets Ryu Nanami, a popular newscaster for the PTV network. She finds herself attracted to the rumored womanizer, but Ryu says that he'd rather die than get married. As Everyone's Getting Married, Vol. 7 (Chapters 30 to 34) opens, Asuka and Ryu are enjoying some time for romance, something they may not be able to do for much longer. PTV wants to send Ryu to Washington D.C., where he will work as an international correspondent – for a term that will last at least a few years. Asuka will remain in Japan and continue her blossoming career in banking, and both she and Ryu believe their relationship can survive the separation. Are they both being naive about long-distance relationships? Akito Kamiya, who desires Asuka, believes they are. THE LOWDOWN: The Everyone's Getting Married manga is an interesting manga because it is about a man who loves the woman he won't marry and a woman who loves the man who won't marry her. It might seem like a shojo high school romance, but it is a mature romantic drama..
Everyone's Getting Married Graphic Novel Volume 7 is one of the better volumes in the series. Creator Izumi Miyazono throws her stars into a situation that will only create more opportunities for stress and strive in Asuka and Ryu's relationship. Rivals, fights, and distance will create conflict and dilemmas that should to make for good reading. I READS YOU RECOMMENDS: Fans of shojo manga about the ups-and-downs of relationships will want the Shojo Beat title, Everyone's Getting Married.